SER Secretaries-General Gerard Richardson (St. Maarten) and Raul Henriquez (Curaçao) with St. Maarten SER Chairman Delano Damien Richardson. 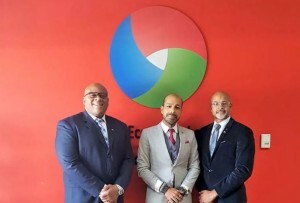 PHILIPSBURG, WILLEMSTAD - Secretary-General of Curaçao’s Social Economic Council SER Raul Henriquez recently paid a courtesy visit to SER St. Maarten where he met with SER Chairman Delano Damien Richardson, Secretary-General Gerard Richardson and staff. Chief on the agenda was the reinforcing and maintenance of a good working relationship among the SERs of the Dutch Kingdom, especially hose advisory councils in the Caribbean part of the kingdom. SER Netherlands endorsed the need for closer cooperation among the Dutch Caribbean SERs and expressed its continued commitment to SER St. Maarten. That declaration was made during Henriquez’s work visit to the Netherlands September 2017. This week’s meeting on St. Maarten was the first time since the inception of SER St. Maarten that there has been a formal meeting between the Secretaries-General. Richardson thanked his colleague for the continued support in particular after Hurricane Irma’s passing. With Henriquez’ visit, a first step was taken to further strengthen the working relationship between the secretariats of SER Curaçao and SER S.t Maarten. The two secretaries-general expressed the need in that session to jointly work on the institutional reinforcement of the advisory role that they fulfill, to continue and improve the working relationship with SER Netherlands and to promote best practices, cooperation and exchange of data in order to learn from each other and strengthen each other.